MIX it up with a fork. Lumpy is fine! Heat up some oil in a pan wide enough for a hot dog to lay flat. I don't deep fry these because, frankly, dealing with the used oil it a colossal pain and never worth it. I even shallow fry my chicken, really. Heat the oil until it's shimmering. You can take it's temperature but I just throw a 1 inch square piece of bread in the oil when i turn it on medium high and when it's brown, the oil is hot enough. Dredge hot dogs in a little cornstarch, pat off the excess (this helps the batter stick!) I cook mine without a stick then add the stick afterwards (saves on burnt sticks and I can cook these in a smaller pan) OR cut the hot dogs into little chunks and do them as minis! Mini's are VERY pop-able!! IF you are making the long dogs, pour the batter into a tall thin pitcher or a jar is even better, the tall mason jars. If you don't have a very tall, thin, vessel, just tip your bowl, really, we don't need any specialty items here and the fewer dishes the better, that's why I do mine in a measuring cup, it works fine. Fry, Drain on paper towel, eat, repeat! I like mine with honey, Connor likes them plain! Go make some corn dogs!! they are a million times tastier than anything out of the freezer section! 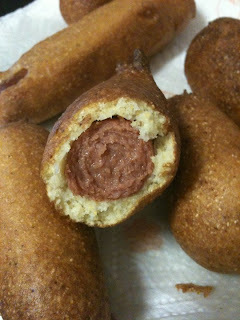 You CAN use less milk to make the batter thicker but I think the ratio here is just right, see the picture, it's pretty even and a nice thickness, not a thick corn muffin wrapped around a dog but a beautiful corn meal coating that adds crunch and sweetness to the hot dog (I use Hebrew Nationals). You can also spice it up with herbs or cayenne or hot sauce, really, however you like your batter, this is infinitely adjustable and futz-able. Play with it, play with your food!